Combine milk with chia seeds; refrigerate overnight or until chia seeds have expanded and milk has pudding-like consistency. Stir pumpkin purée, 2 tbsp of the maple syrup, and pumpkin pie spice into chia mixture. Stir yogurt with remaining maple syrup. Layer half of the chia pudding, yogurt and granola evenly in four 8-oz glasses. 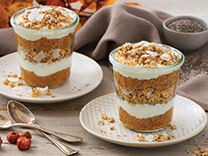 Repeat layers once, ending with granola. While nutrition experts recommend fueling up on small, frequent meals, it's important to make smart choices when it comes to snack time. 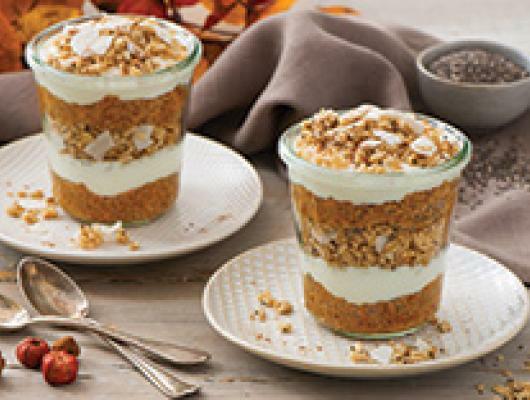 These gluten free chia and pumpkin parfaits below can be made ahead of time for a quick and tasty snack or breakfast. The “superfood” chia seeds will keep you full longer, while the granola offers a satisfying crunch along with added protein and fibre.